It is difficult, at times, to understand different perspectives on the compatibility of religions. Or, perhaps to be clearer, I might say that it is hard to understand without caricature other people’s ideas about religions. For example, for those raised on conservative Christian teaching, there is no question that Christianity is incompatible with dozens of others world religions. We have heard this asserted from pulpit, lectern, and printed page so often that it is clear to us that Buddhism conflicts with orthodox Christianity in ways that are irreconcilable. Truths are black and white. We can be absolutely certain of most things. The law of non-contradiction reigns supreme. This is the perspective on religion known as exclusivism. And yet, many hold to the notion that all religions are somehow leading people to climb the same mountain, though via different paths. Though Jesus claims to be the way, the truth, and the life, some suggest that his illumination shines through the teachings of other world religions such that all provide a functional path to God. In its most benign forms, this perspective on religion teaches that there is some truth in all religions, and therefore no conflict between them in the absolute core. One might make progress toward salvation (whatever that means) as a Christian, Buddhist, Hindu, or Muslim. This view is often called inclusivism. There is a third perspective on religion, which is called pluralism, that argues we just don’t know which of the religions has the truth (if there is one), but that all may have a piece of the truth. Those that propound this view typically trot out the illustration of blind men feeling different parts of the mountain, an image which Lesslie Newbigin and others have helpfully identified as arrogant presumption of omniscience on the part of the speaker. This perspective often entails a sort of agnosticism, which asks the believer to wait and see before making final commitments. In didactic texts, whether of the form used for indoctrinating children through Fundamentalist Christian worldview courses or those used to influence college sophomores in a world religions course, these perspectives are often presented triumphalistically. The pastor shows how the god of Mohammed is really vastly different than the God of Paul; the political science professor dons a head scarf and asserts that the two deities are really the same without understanding the basic theological issues; the tired, uninterested arm-chair philosopher argues for pluralism because he really wants people to stop arguing and killing one another over religion. These approaches and their related variants often tend to dismiss alternative perspectives without increasing understanding. 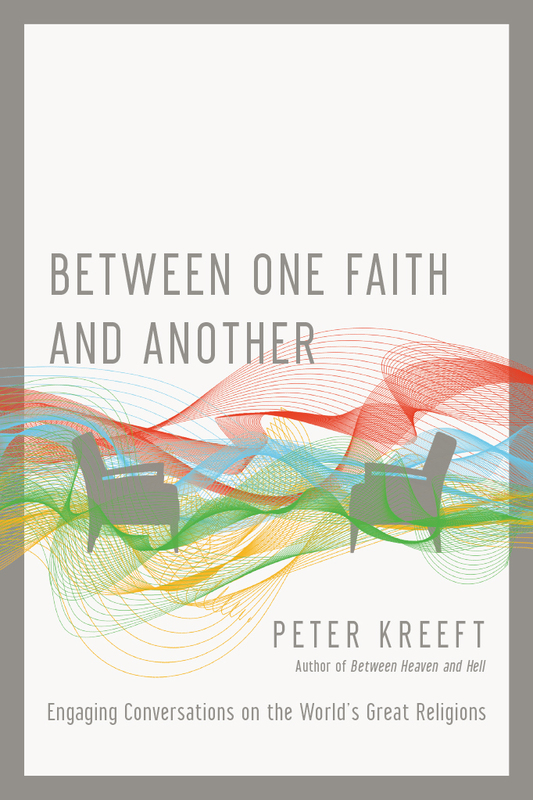 For those interested in understanding better the relationship between inclusivism, exclusivism, and pluralism, Peter Kreeft has written a new book, Between One Faith and Another: Engaging Conversations on the World’s Great Religions. I was initially skeptical of this volume, because it is written in the form of a dialogue (or really a trialogue), which is not my favorite form of philosophy. I am also aware that Kreeft is a committed Roman Catholic who converted from evangelical Christianity, so he has a distinct perspective on the issue; I wondered how well he could represent the perspectives in this format. My doubt, however, was ill-founded. Kreeft has produced a volume that will help people from all three perspectives to understand the others better. This is because, as Kreeft admits in his introduction, he has sympathies with each of the three characters and their perspective. Kreeft dealt the cards fairly when assigning roles and allowed the dialogue to unfold relatively naturally, without cheating arguments by exposing only flaws or highlighting only strengths. The volume is a conversation between two students over the content of a world religions course. The atheist/agnostic rationalist is an exclusivist, seeing all the conflicts between different religions. He argues that not only do they conflict with one another irreconcilably, but that they are therefore all wrong; this the is character that sees the fatal flaw in all religions. He is the extremely rational college student who likes to blow the whistle on logical fallacies; sort of like your average Christian homeschooler, but without the background knowledge of Adventures in Odyssey. The second main character is also a fellow student with the exclusivist, she is the inclusivist who believes that we’re all climbing the same mountain. She rightly notes the moral similarity between most world religions and, sometimes through an act of will, argues that religions have a common center and only conflict (or appear to conflict) in their practice. The rigorous logic of the exclusivist seems over harsh for this theologically liberal Christian. These two characters engage in a Socratic dialogue after class, since both of them come off with understandable disagreements with the Professor. This is, perhaps, the most unrealistic aspect of the entire book: two people with different worldviews engaging in thoughtful dialogue over a long period of time. However, if the reader suspends disbelief, this is a helpful heuristic tool. True to reality, Kreeft allows the debate between the inclusivist and exclusivist to wander afield and get mired into the predictable conflict over logic, non-contradiction, and compassion. However, here he inserts a third character, the pluralistic professor who tries not to present his view in class (and perhaps actually lacks a clear view) but simply presents the different religions with their strengths and weaknesses. This professor functions as a plot device to referee the debate when the students get off-track and caught in do loops of circular argument. Overall, the conversation is engaging and informative. There were several points along the way that Kreeft’s dialogue made me laugh out loud because he naturally inserted humor in an otherwise potentially dry discussion. The content of the conversation is relatively natural in its flow, though Kreeft thankfully cleaned up the rhetoric and expression of the speakers to make the debate more precise and linear than would be likely in a real, human conversation. There are points throughout the volume that the reader is left a bit frustrated, since there is no clear hero, no matter the reader’s perspective. It's a good sort of frustration, though. The inclusivist, exclusivist, and pluralist all score points and all get scored on. At times, each is infuriatingly mired in his or her thought process. However, the characters do develop over the course of the volume, as they each accept the validity of the others’ viewpoints where appropriate. None of the characters “convert” to another perspective, though the rough edges are certainly worn off in several cases. This is, in short, an example of the sort of conversation that should be happening in society, especially in higher education, but which too rarely occurs. Between One Faith and Another raises more questions than it answers, but that would make this a useful text for multiple audiences. As a parent of a homeschooler, this is the sort of text that I might consider using in a high school world religions course. It covers many of the basic facts of various world religions, but gets to the more basic (and often ignored) question of how we should deal with the variety of religions. This volume would be useful in a comparative religions course in a religious or non-religious higher education setting, because Kreeft does well at being even-handed throughout the conversation. For the casual reader, like me, this volume is truly enjoyable. The conversation moves along, the content is clear and helpful, and the reader’s character is formed by sympathizing with people with whom one would otherwise naturally disagree. This is worth reading, even if simply for the enjoyment of it.